Now that we’ve entered a new year, you might thinking about ways you can revamp your home in 2019, or how you might spruce up an investment property to get a higher rental return from it month after month. While there are numerous steps you can take for either of these endeavors, keep in mind that it pays to concentrate on key rooms, such as bathrooms, living rooms and kitchens, in particular. If budget is a bit of an issue, yet you really want to renovate your kitchen this year, there are ways to cut costs and still get this important space looking more modern and stylish. Read on for some top tips for remodeling a kitchen on a budget that you can follow today. For starters, you’ll make life much easier for yourself, financially, if you set a budget for the work in advance. Determine what you feel comfortable spending to remodel your kitchen, and then work back from there to decide which elements you will and won’t be able to afford for that price. By setting a budget, you’ll ensure you don’t end up getting carried away with the excitement of the project once it’s started and blow your savings reserves without meaning to. Make sure your budget covers expenses from various areas, too, such as contractor demolition and installation fees, material costs, insurances, additional warranties, finance fees and the like. Depending on your situation, you may also have to get a loan from your local bank or another lending institution to do the kitchen remodel. If so, speak with providers to find out exactly how much you will have access to. You don’t want to end up paying out more for the work than you can afford. Have a Plan for the Work? Next, remember that it’s easier to keep to your budget if you put together a plan for the remodel work and don’t let it drag on and on for months. Once you have an end date in mind of when you want the whole project to be complete by (you may need to speak with a contractor for guidance), you can work back from there to determine the necessary order of tasks. By coordinating tradespeople carefully, and ensuring you have all the required materials on hand as different people need them, you will have some more control and be better able to make the whole renovation run like clockwork. This will also keep costs down because there will be fewer surprises along the way. You’ll be less likely to have to pay extra for contractors to wait around while other workers finish jobs, or to pay higher costs to have appliances, tiles or other materials shipped via express post to arrive in time for installation. 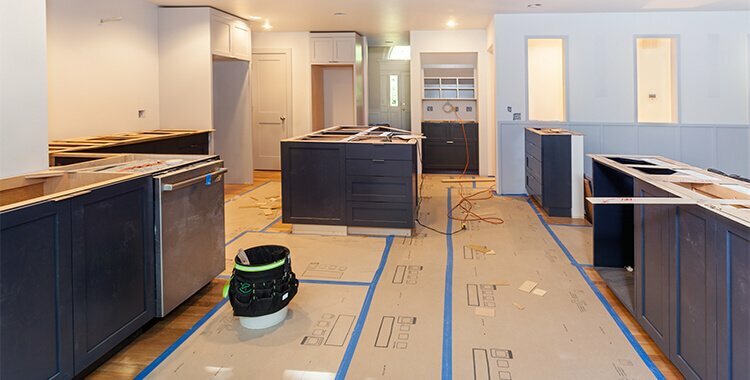 Since you probably won’t have much in the way of food preparation tools available during the kitchen remodel, you’ll also save on takeout costs if you can get the project completed sooner rather than later. Of course, as you would imagine another prime way to remodel a kitchen on a budget is to simply find ways to reduce expenses in general. By being strategic about how and with whom you outlay money, whether on labor, materials, financing or something else, you will keep total project costs down. Instead of buying absolutely everything brand new, see if you can re-use any of the items already in your kitchen before the renovation work begins. Oftentimes you’ll have decent tiles, tapware, lighting or other pieces available from your former kitchen that will work well. For instance, you may need to hire a Washington faucet repair service to sort out faucets and make them ready to re-use in your home, or you could have cupboard doors good-to-go with a fresh coat of paint and some new handles. Alternatively, another option is to spend less on materials by buying quality secondhand ones at auctions, online or elsewhere. You may be able to reduce costs, too, if you do some of the work yourself or take advantage of offers of help from suitably experienced friends or family members. If you don’t know of anyone who can do the work for you, and if you can’t do much yourself, make sure you at least source affordable, reliable tradespeople through recommendations or reading reviews. Always interview the contractors on your shortlist and make sure you get quotes in writing, so the price can’t unexpectedly be raised half-way through.